Getting That Feeling - Family Times is an award-winning magazine with staff-written news, feature stories and artwork that inform and inspire Central New York parents and their children. When 3-year-old Emily sees her older brother has cut his finger, she grabs her own finger and winces. This “mirroring” effect, where we experience “secondhand” pain, is something we have all felt. Research is demonstrating there is a neurological link between our own experience of pain and our perception of pain in others. The parts of the brain active in personal experiences of pain are also active when observing pain in others. This ability also appears to be present in other animals. Brain scans and neurological research might make one wonder if empathy is an automatic process rather than something that is learned. Human empathy, however, requires a variety of skills and abilities shaped by experience and influenced by many factors. In short, empathy is something we are neurologically primed for, but it is greatly influenced by our experiences. Researchers say children require teaching and guidance in order to fully develop empathy skills. Empathy is essential for acts of compassion and kindness toward others. Parents have the opportunity to teach children the skills and attributes needed to become caring, considerate adults. Human empathy depends on the ability to share the emotions of others, to feel what other people feel and the ability to understand the perspective of someone else. This is a developmental process. In order to share in feelings, the empathetic person needs several skill sets. • The ability to distinguish one’s own feelings from the feelings of others. This requires a sense of self-awareness. Toddlers are working on this developmental skill. They will sometimes mimic the emotions of those around them. • Being able to take another person’s perspective, understanding another’s point of view. A preschooler may struggle if the other person’s perspective is different from his or her own. Children this age are not developmentally able to see the situation from a different perspective. This skill is better developed by the time children enter kindergarten. • The ability to regulate one’s own emotional response. Again this is a developmental task that improves with practice and maturity. Young children can feel overwhelmed with “mirroring” of others’ emotions and have trouble managing their reactions. A child may get upset over a situation that does not directly involve him. As he matures, he will learn to modulate his own emotional reactions. It takes years for a child’s empathy to mature, but as a parent you can start empathy training at an early age. Help your child by labeling his or her feelings. Young children lack experience identifying, labeling and managing feelings. Help them put a name to what they are experiencing. This will help kids organize and understand their emotional world. Describing how others are feeling is another example of empathy training. Children’s picture books have terrific examples of emotional facial expressions and “empathy” situations. Over time your child will internalize your comforting. This is a long, gradual process. Remember: A 2-year-old will typically not be able to understand another’s perspective: For example, Grandpa may be feeling too tired to go out to build a snow fort, but Sally’s need to go out and play in the snow will, in her mind, outweigh Grandpa’s feeling like he needs a rest. This is a cognitive task a 5-year-old is just beginning to understand. 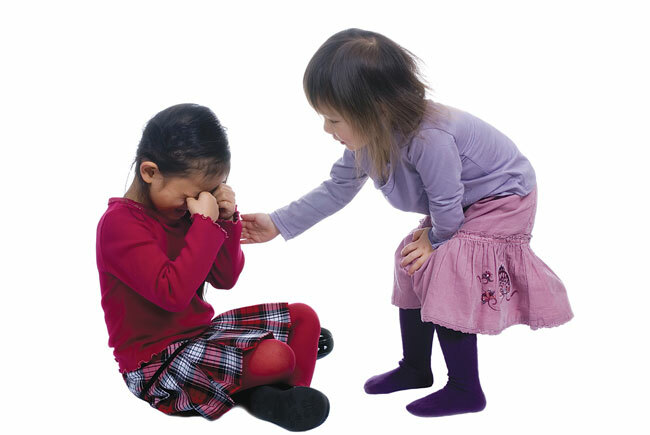 Look for empathy teaching opportunities throughout the day and during your child’s activities with other children. There is a lot to learn and it takes many years for a child to develop empathy skills. If you can demonstrate empathy, you will be your child’s best teacher.